After a few weeks off for exams and holiday, here is a quick post related to a recent USA Today article on the growing popularity of bike-share programs throughout the country. While New York got the fanfare during the debut of its massive Citi Bike program a few months ago, the city is just following in the footsteps of other cities throughout the country. America’s bike-sharing fleet is expected to double to nearly 37,000 bicycles next year with New York, Chicago, and DC leading the way. The concept of bike sharing is quite simple: pay a daily, monthly, or hourly fee to pick up a bike at one station and drop it off at another station. It’s a cheap, fun, and healthy way to make short treks around town and doesn’t involve any of the inconveniences of actually owning a bicycle (maintenance, worrying about theft) or using public transportation during crowded peak times (zero personal space, etc.). Bike-sharing is a relatively inexpensive way to provide supplementary public transportation; while subways provide heavy transportation to general areas or nodes, bikes are spokes that provide localized transportation to individual locations with more route versatility than buses. Anne Kadet of the Wall Street Journal offered some great insight into her experience with Citi Bike during its debut. The bikes are well-built, offer LED displays, and are comfortable and adjustable to many shapes and sizes. Many of the downfalls focused around not fully understanding how to use the system (not understanding when it needed to be returned) and early flaws in the system as the city hadn’t yet worked out all the kinks. Like any other form of public transport, success comes with versatility. Since you don’t actually own the bikes, you can’t lock them up wherever you want. This means you’re dependent on docking stations being located within a reasonable distance of where you want to go. While New York may have a been a late-comer to the show, they certainly entered with a bang. While some cities start slow and gradually add more stations, NYC began with 330 stations scattered throughout Manhattan; Citi Bike averages more than 42,000 trips per day. Chicago has over 400 stations and DC is up to about 300 stations. Bike-sharing is much easier to implement in denser, more urbanized cities and much more difficult to implement in the more sprawled-out cities of the south and west. A major factor in the success of a bike-sharing program is the safety of cyclists. In denser cities such as New York or San Francisco, drivers face multiple obstacles at any given time (jaywalkers, stop signs, traffic lights), which naturally lower speed limits and make drivers more cautious. In cities that are less dense, have higher speed limits, and shorter blocks (which means fewer traffic lights or stop signs) implementing a bike-sharing system creates conflict between drivers that aren’t used to many impediments and cyclists that want to use the road. 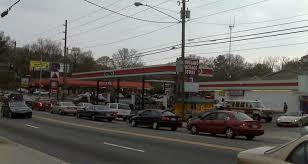 This seems to be the major obstacle in creating a system in Atlanta. The city isn’t built for slow-moving traffic and isn’t accustomed to heavy bicycle traffic. While DC and Minneapolis are not nearly as dense as San Francisco or New York, which means they don’t have the natural cautions presented to drivers, they have invested heavily in dedicated bike lanes that offer more protection to cyclists and thus a bike-sharing program can be more successfully implemented in a larger area. Outside of downtown and local neighborhoods such as Decatur, Virginia Highlands, and pockets of Midtown, Atlanta is built for high-speed traffic and has done little so far to supplement that with dedicated bike lanes. Causal cyclists using the a bike-sharing program on Peachtree through Midtown and Buckhead or basically anywhere on Ponce just simply won’t work. Cyclists wouldn’t risk venturing onto roads with 45 or 55 mph traffic and drivers wouldn’t put up with novice cyclists navigating high-speed thoroughfares. 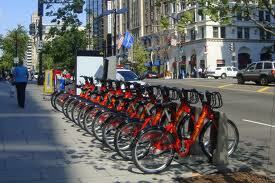 That shouldn’t stop Atlanta from installing a bike-sharing program though. 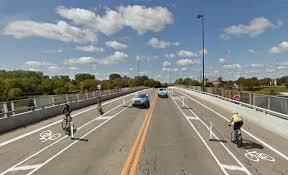 Such a program would be tremendously effective in localized neighborhoods where traffic is slow and streets are small. Our street infrastructure doesn’t allow for casual cyclists to safely move between these neighborhoods, but at least we can start somewhere. A surge in popularity could be the impetus for dramatic changes along major arterials to make cycling safer and more widely accepted as a smart and legitimate way to travel around town. While Atlanta has a number of issues to work through, other cities in Georgia are ripe for investment in bike-sharing programs. 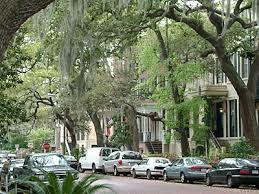 Later this year, Savannah will be the first city in the state to implement such a system. If any city in Georgia is a great candidate for a system, it’s Savannah. The city has many narrow streets with slow-moving traffic and is a beautiful place to walk and bike. Unfortunately the city has indicated it may launch with just two stations; this clearly doesn’t realize the potential of bicycling as a major form of transportation and could undermine the program’s overall success. Reception to the system may be tepid simply because it’s inadequate and that could ultimately convince politicians that there is no interest in such a system. Athens is another prime candidate for bike-sharing. The town is relatively small and has many bike-able streets. While downtown and 5 Points are already established destinations that can be reached by bike within the core of the city, Prince Avenue is coming along as another major commercial neighborhood. As plans progress on transforming the street into a more walkable and bike-able thoroughfare, a larger bike-sharing system becomes more realistic. Stations could easily be assembled in multiple locations downtown, multiple locations on campus, in 5 Points and along Prince Avenue. The city should seriously consider this in the coming months and years.